This pair of maracas sets the beat to melodic fantasies, south of the equator. 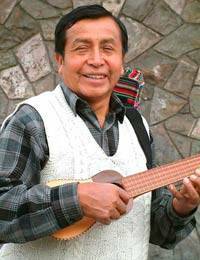 Dionisio Quilla crafts the lively instruments from tutuma gourds, which he dries under the sun once emptied of their seeds. When ready, he uses a burin to mark and paint a jungle composition of exotic allure. The maracas are filled with small beans, and sealed with tornillo wood handles. Please expect a slight difference in the shape and since of the maracas, which depends on the gourds' natural shape. 24 cm H x 7 cm Diam.